On second and third thought she seemed as something of an anomaly. Who does what she did? No modern woman, certainly. The shattered alabaster jar. The nard. The tears on His feet. Her hair — a washcloth? Such appalling delicacy amid the jeers of men who knew her, perhaps all too well. Its the stuff of soap operas today — stories of lives reduced to fleeting passions. Reduced to passing feelings of emotive excess. And then a fourth and fifth look. To behold in those eyes and shrouded in that scarlet robe something a bit more luminous, a bit more real. Something of a lifetime, and the story of a soul. It was love that moved her. That propelled her tears. A cavalcade of truth must have swept over her lacerated heart. An overwhelming sense of things as they were. Harrowing. Real. Pathetic. 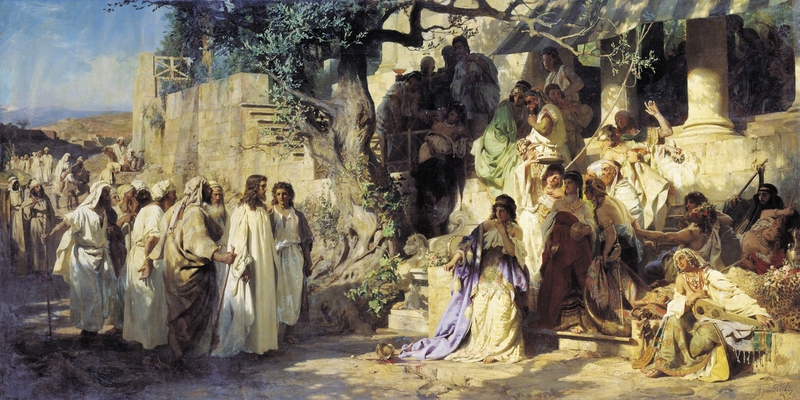 After His mother, and the Twelve, Mary of Magdala was among the closest friends of the Savior. The one woman whose brother He raised from the dead, though she doubted. The one woman, whose home He visited to rest. The one woman to anoint Him, in a daring gesture that would be told for generations. The one woman to weep, beneath the torrent of his blood, as the world witnessed that first Pieta’. Her anointing, the achingly moving gesture of human love, dared at a highbrow dinner party among the teachers of the Old Law, was then again to be repeated in haste and darkness on a Sabbath eve, by a borrowed grave. It must be the way loving much goes. Against every modern conception of inferiority complexes and inequality. Of pretensions and presumptions. Of callous calculating and hesitant conditioning. The kind of unreserved prostration that is not servitude, inferiority — but liberation. Because what precedes her great love is a great forgiveness. A surety of mercy. A Mercy claimed, personally after a long rejection. And that is freedom no social equality construct can build up, make up, break down. In one action, she wrote a first manifesto of women’s freedom. And taught more than they could have otherwise known about what happens to one whose heart is free enough to enter in to that reciprocal giving and receiving where the gift received is always greater than the offering presented. Kneeling there cost her everything. It was not intended to be a re-positioning of women — some jarring social or political move, some statement of adequacy or equality. It was an intensely private moment, gone public. One moment, that our limited modern criticism can look back to and pause at — finding there the reversal of presumed inequalities. A ‘sinner’ was to be given access to the heart of God as her recompense. Her gesture of tender affection bared for the world what the blood of the Cross would soon achieve. And He let her near. For one who knows more than enough about the giving of the flesh, in that approach, she becomes the one to teach what is gained in the gift of one’s soul. Surely this was the love-surge of penitence. A sorrow that emerges as a force of pain from the depths of the soul — surges, as if bottomless, piercing, unrelenting. A vision of the mediocrity of loveless and squandered goods — a striking, forceful fear of waste. A deep, dark sorrow that forebodes days even as the dawn rises, relentless. But also the love of hope. The love that stares at despair in the face and shatters it with a gaze — conquering the darkness and doubt finally, as the infusion of light passes through the dust of a broken heart turned to stone. And yes, the love that flows as showers of tears. Because what precedes her great love is a greater forgiveness. A surety of mercy. And Mercy melts the stone cold heart. Crucial is this meeting point of loves — crucial for it prefigures the Cross. She shatters the alabaster jar. Or was it her alabaster soul? Those veins in translucent stone, now coursing the lifeblood of grace, pouring forth the fragrance of royals that others want to sell off for profit? She has already sold off all of herself. Imprisoned she has been in a thousand senseless embraces. That was enough. This is an attempt at something else. All the precious nard in the world seems insufficient. And perfume fills the room, infusing the ashen dust of waste, with pervading beauty. An appalling delicacy. A squandering to those who behold, and yet fail to see. Three hundred denarii? How do they compare to the return of the daughter? There was a greater poverty to be satisfied. A soul to be saved. Nothing was lost. Nothing wasted. Neither the nard, nor the pure alabaster, nor any one of those tears — the very salt of her life, poured forth in oblation, as incense, not rising, but strangely falling on sacred ground. God was there. And we look, dazed, and just cannot fathom this, because like her we have more nard than we know what to do with. And yet we waste it, no longer knowing the difference between the waste and the offering, the loss and the profit. Everywhere we trade the eternal for the temporal, the purely fragrant for the scintillating simulation. The trade-off scandalizes nobody. Modernity thrives on pretensions of love, on egoism, on aspirations for senseless pleasure. A new kind of appalling delicacy pervades the cold and heartless embraces we have offered everywhere at the cost of our souls. She has loved much. She would grieve for her soul restored at cost of His life. She would grieve His death as darkness covered the land, and water and blood fell from His lacerated side. She must have seen in that wound the first crack in the broken vessel she once had held — and understood then what her offering had meant to Him. Again she would grieve at dawn. And He makes her the first witness of His rising from the dead — apostle to the apostles by an empty grave in a fragrant garden. Penitence? Repaid with the squandered abundance of new life. She offers pure precious nard, and tears, and her hair. And for the offering of her soul, He pours for her the wages of paradise. What she has done, shall be told until the end of the age. Not just the appalling delicacy of her love, shall be what will be told. But the story of her shattered alabaster soul. Those cracks, those veins in translucent stone — dark recesses where once coursed hopeless desire — will over and over again be infused with the fragrant ointments of grace. And stone will turn once more to flesh and blood. And desire ever more. It must be the way loving much goes. We still call hers — the better part.